Fire Service preservation movement in Ireland as we know it today began about 30 years ago, at that time most old fire engines in the country were owned by local Authorities. Old fire engines in private hands were few and far between. The first person I knew that had old fire engine preserved was Chris Prendergast in Co. Carlow and that was in the mid 1980’s. In 1986 Chris was one of 3 people that organised the Dublin Bay Rally which ran until 1994. By the late 1980’s there were a few more fire engines in private hands notable 2 ex Co. Clare appliances one owned by Pauric Cullen from Mullingar and the other by Sean Keoghan from Kilbeggan. By that the time the preservation movement was gathering steam, Pauric Cullen set up “1st Fire Engine Rally” on Saturday 6th Oct 1990 at Locks Distillery, Kilbeggan followed by 2 more rallies in 1991 and 1992. This really started the ball rolling more private preservationists were appearing on the scene Dan Doherty from Roscommon, Jim Fallon from Sligo, Garry Manahan and Jim Kavanagh from Dublin, Bernard O’Grady from Kilbeggan, Jim Byrne from Drogheda, Des Durkin from Dublin. A Collection of Helmets and Fire Memorabilia was exhibited at the Fire Engine rally by Las Fallon from Dublin.Firemen from around the country started to bring out appliances old and new from their own stations. 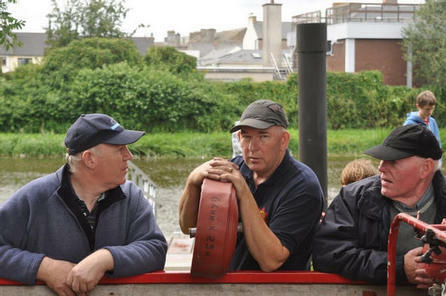 The Connelly Bros., Station Officer Paddy and Driver John from Graiguenamanagh brought along 2 Appliances, Brigade Fitter Teddy Ryan the F12 from Kilkenny City, Co. Louth’s 2 Dennis F12s from Dundalk and Drogheda, Irish Rail’s 1935 Merryweather from Inchicore works, Station Officer Robert O’Connor with Carlow’s 1936 Ford V8, Dublin Fire Brigade sent along a TL, Station Officer Tony Lalor Austin /Roberts from Monasterevan, Station Officer Jim Hogan from Newbridge an ET, The Doyle Bros from Naas Anthony and Tommy the Unimog, Michael Corcoran from the National Transport Museum a Horse Drawn Steamer, on home ground Station Officer Tom Webster from Athlone ensured the Karrier and ET were there. In the late 1990’s Mick Murphy from Innishannon ran a fire section at the Innishannon Steam & Vintage Rally. The fire section at the rally ran for 3 years and was a huge success. Then in 1999 I decided it was time to do my bit by calling a meeting at our home in Athy and as a result of that meeting The Irish Fire Service Preservation Group was formed in Athy on 19th January 1999 better known today as the Fire Service Trust. Over the last 11 years the Fire Service Trust has grown into an internationally known Preservation Group representing the Irish Fire Preservationist at events at home and abroad. The Fire Service Trust has also become a familiar face at Heritage Centres, Libraries, Conferences, Station Openings and Recruit Passing out ceremonies, exhibiting old fire appliances, Archive Material, Photo’s, Log books and Equipment relating to the history of the Fire Service in Ireland. The Fire Service Trust has taken into its care Fire Appliances, Equipment, Documentation and Photographs from Fire Brigades and Individuals from all over Ireland. The trust has now the largest collection of old Fire Appliances, Equipment and Archive Material in the country. The day to day running of the Trust is carried out by the Management Team drawn from the Trustees.